The good news is that five of the of the top nine States have made major progress in decreasing violent crime during the last ten years. Florida dropped almost 255 points from its 2001 rate to its 2010 rate. Maryland and New Mexico dropped 235 and 192 points respectively. South Carolina and Louisiana both dropped over 100 points during the decade. 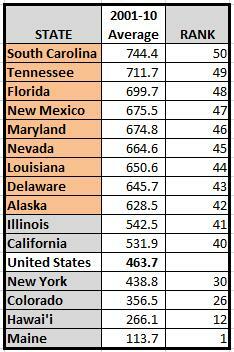 Four States still had rates in 2010 that were over 600 violent crimes per 100,000. Two of those States (Delaware and Tennessee) have made little progress over the decade and the other two (Nevada and Alaska) have lost ground from where they were in 2001. Nevada began the decade with a violent crime rate below California’s, but the rate jumped in 2006, peaked in 2007, and has slowly declined. Despite the decline, the significant drop of other high ranked States has placed Nevada as the most violent State for the last two years. 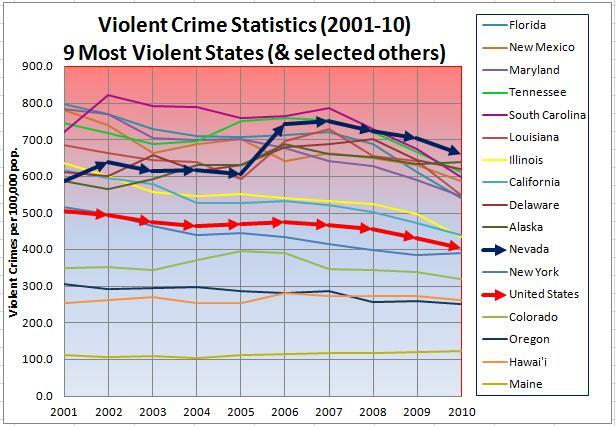 Graph 1.0 shows the average violent crime rates over the last ten years for the eleven highest ranking States, plus five other States that are representative of borderline, middle, and low ranking States. Two of the eleven highest ranking (Illinois and California) were ranking relatively high in 2001, but dropped rapidly during the first three years of the decade and ended up with violent crime rates that were just over the United States average. ¹ The District of Columbia was excluded from this report as it is not a State and is more representative of an urban area. ²The violent crime statistics are from the FBI’s Uniform Crime Reports, Table 4, years 2001-2010. The information can be found at http://www.fbi.gov/about-us/cjis/ucr/ucr.